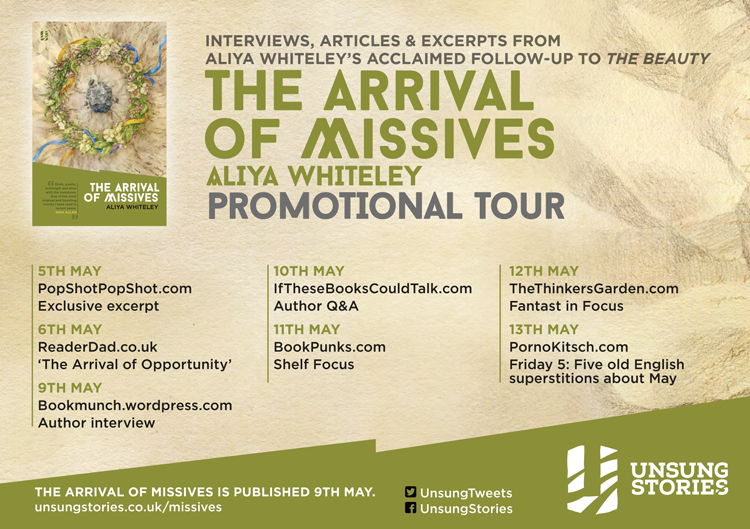 Aliya Whiteley’s second novella, The Arrival of Missives, goes on sale on Monday 9th May. To celebrate the book’s launch Reader Dad is very pleased to welcome Aliya back to talk about the book’s origins. There are lots of brave young women out there in literature but I never wanted to write one myself. I’ve certainly loved many of them. I reread Jane Eyre many times and winced at Emma Woodhouse’s mistakes. I recognised the yearnings of Ursula Brangwen and held my breath for the nameless bride in Rebecca. Modern books have given me female leading characters who are perhaps more action driven (which you could say is a trend in popular entertainment generally) in the form of Halo Jones, Lisbeth Salander, and Lyra Belacqua. But the more these characters found themselves in incredible and dangerous situations, the less able I felt to create one myself. I wouldn’t be writing from a position of empathy. I didn’t feel I would make the same choices if I ever got thrust into such interesting perils. As a teenager I was bookish and quiet (well, I still am). I wished for excitement and did nothing about finding it in any place other than within the pages of the stories I loved. And I certainly didn’t want to create a heroine like myself – what would be the fun in reading about that? But then The Arrival of Missives popped into my head, and I started to write a story that, as a writer, terrified me. I didn’t have the emotional distance from my lead character that I thought I needed to make it work. My own experience of being a young woman, dreaming of a future I was also scared of, kept getting in the way. Somerset in 1920. Shirley Fearn is a bright young woman who has opinions about the immorality of war and the importance of love. She feels passionately about education as the tool that can guide young men towards making a better world. She also feels passionately about her mysterious schoolmaster, Mr Tiller. She has plans for her future. For everyone’s future. When I first started to get into her voice I thought of her as the opposite of me. I soon realised that she was utterly recognisable: not in deeds, but inside her head. I was giving her thoughts and feelings that I had experienced as a teenager. I might have been quiet, but I had lots of opinions. It’s not a question of what both Shirley and I were thinking, but when and where the opportunity arose to express those thoughts. Writing Shirley made me realise that character and opportunity are not automatically the same thing. Often the situation of the book controls characterisation, feeding into the idea that we learn from our experiences and become the sum of them. This is the act of making meaning from our lives. So Ursula Brangwen (a huge influence on The Arrival of Missives) becomes a teacher and finds the experience changes her. She recognises the intense, seething battle taking place between the young and the old for power, and therefore must decide on what side of that battle she lies. DH Lawrence was a master of this organic growth from event to action to internalisation, I think, and the struggle this creates in us all. How Ursula views that relationship between age and youth is, though, entirely a creation of her mind. She has such strength of will, and it paints the world around her. That’s what helped me to write Shirley. Very strange things happen to her (events that we might characterise as science fiction or even horror in terms of literary genre) and yet she sees them all as a reinforcement of her world view. I found that I loved writing Shirley’s forceful decision to interpret all the things that happen to her, and her small village, as steps towards the future she wanted. When I reached the end of Shirley’s story she had changed; what’s the point of writing if people, characters or otherwise, aren’t changed by it? But I’m still not sure if the change within her breaks my heart or reassures me. I suppose we all have to alter to grow. We can’t stay the same, and character can’t be an excuse for stagnation on the page or in real life. Having said that, I’m still quiet and bookish. But it doesn’t worry me so much any more. It turns out that being afraid of whether life will ever give you an opportunity – whether the unique things inside of you that makes up your character will be wasted – is a big part of being young. Writing Shirley Fearn reminded me of that, and also proved to me that the thoughts are equally as important as the actions. It’s how the two relate to each other that decides the future, whatever it may be.